Sheryl Crow and Stevie Nicks are good friends, and though Nicks served as a mentor, their styles are oh so very different. Remember, we just covered Nicks and her pivotal album Bella Donna last week and now we are on to Crow’s breakthrough album. Nicks’ backstory is also quite different – she was making music with then boyfriend Lindsey Buckingham, taking odd jobs to pay the rent, when Mick Fleetwood calls her boyfriend to join the well-established and respected Fleetwood Mac, but he won’t go unless Stevie can too. And there you have it, great rock ‘n roll history based on the magic that occurred. Crow, a child of musical parents, taught music, sang jingles and then backup for some pretty major folk. She toured with Michael Jackson before stepping out bigtime from the shadows with this, her second attempt at a debut album in 1993 from which “All I Wanna Do” got her loads of attention. 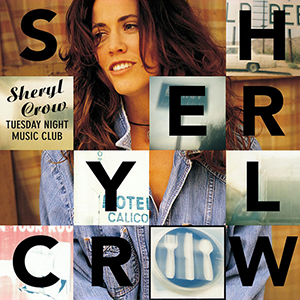 In contrast to Nicks’ mystical mystique, Crow was comfortable rockin’ the MaryAnn look in plaid shirts and cutoffs, looking like a laid-back, guitar-playing natural woman (aside – when I first heard “Natural Woman” by Aretha Franklin, as a little girl, I thought she was singing – “you make me feel like a man should a woman” and that she had lost her shawl, not soul, which was recovered from the lost and found). I am very glad to have found this CD for a buck at Housing Works. I’ve had the tape for nearly 20 years, but as we all know I can’t play cassettes anymore. I probably wore down “Strong Enough” and “No One Said It Would Be Easy” anyway. Good songs. And though I like this album much better than Nicks’ Bella Donna, Stevie’s songs like “Landslide” and “Silver Springs” outrank any of Crow’s on my long list of all-time favorites. However, Tuesday Night Music Club is a much, much better workout album. Off-topic: You know how I like learning the origins of songs? Well, today on CBS’ Sunday morning program, musician and producer, whom I’ve never heard of, Mark Ronson was interviewed. Turns out he produced Back to Black, the Amy Winehouse album that currently provides the background for more than half of the long workout (my long workout is a little more than an hour and the short one, which does not include Amy, is 38 minutes). He was also a friend, and one day when Winehouse told him that they were trying to make her go to rehab, he said no, no, no. Understandably he is regretful, but they did put out a quality piece of work and now I know who he is. Btw – another beautiful Sunday in NYC.